Artists can be a quirky lot. Creative impulses often place the artist on a path that veers away from the ones most traveled. 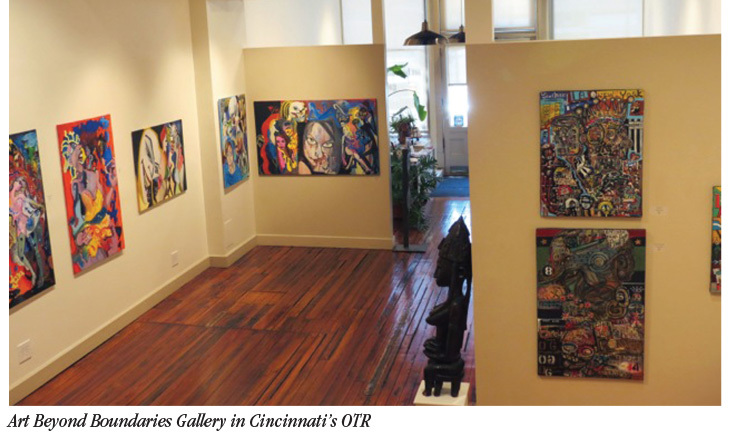 Nowhere is the less traveled path more notable than on the walls of Art Beyond Boundaries gallery at 1410 Main Street in Cincinnati’s Over the Rhine enclave. The gallery is devoted to artists with disabilities that have nothing to do with the creative process. The disabilities can be physical or cognitive, according to J. H. “Jymi” Bolden, gallery director and curator. “What we display here on these walls is ability, not disability. These artists (on display) have talents every bit as compelling as other artists, but they have been shut out of the mainstream art venues for reasons that have nothing to do with their creative abilities,” he said. Currently a show entitled “Say It Loud” is being exhibited at the gallery. The artists featured are: Ricky Michaels, Michael Todd and Kelvin Poole. The show runs into September, and draws patrons of the arts from the tri-state area (Ohio, Kentucky and Indiana), as well as regionally and nationally, and even internationally. As the current Say It Loud exhibition illustrates, the art found at Art Beyond Boundaries is eclectic and diverse. “The artists whose works are displayed here bring the perspectives of their experience to these walls,” said Bolden, himself a practicing creative photographer with a degree in fine arts from the Art Academy of Cincinnati. Primarily, patrons who visit the gallery will find collections of paintings that carry messages as well as graphics. Some of the compositions are conventional flat art with 3-dimensional aspects incorporated as part of the graphics. Paintings are done in oils and acrylics. The paintings include several with strong, vibrant colors and a diverse palette. There is a Picasso-inspired quality to some pieces in the exhibit, and a wonderful random intricacy to other pieces in the show. “Really, we can talk of the pieces in the exhibit and describe them and all the rest. But the experience of the gallery is worth seeking out,” Bolden said. He encourages everyone who visits the city to put Art Beyond Boundaries on the list of must-visit stops, because there is nothing to substitute for seeing the actual art and experiencing the totality of the exhibition now on display. Call for gallery hours at 513-421-8726.